If you tuned in for parts 1 and 2 of this feature, you'll be totally up to speed with the high-ISO capabilities of your camera, and you'll have seen that in the right conditions you can get good photos of the aurora with nothing more than consumer-level DSLR equipment. If you missed them, part 1 is here and part 2 is here. In part 3 we'll look at what can happen when the conditions aren't right - something I have experience of, unfortunately - and use this to work out what kind of equipment gives you the best chances of getting some good photos. 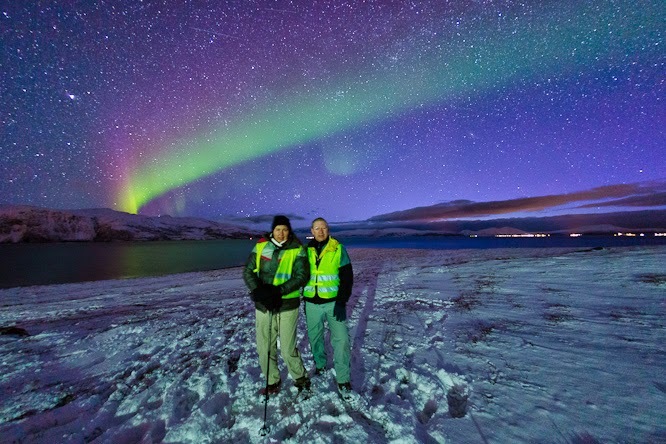 On my short trip to Iceland in 2012, we only had one night with clear skies (and no moon), but the aurora didn't show. At least, not to the naked eye. If you looked out of the corner of your eye towards the northern horizon there was a sort of glittery cloudy feel to it, but if you looked straight at it there was nothing. However, the camera proved that there was something there. 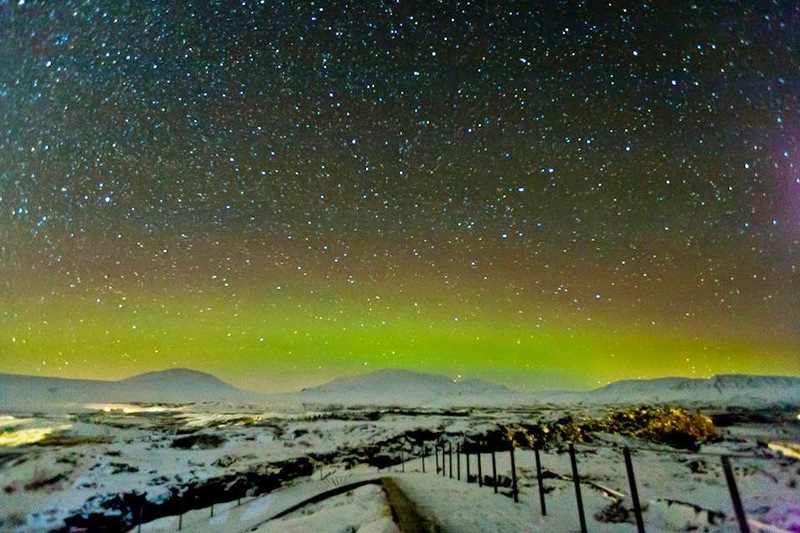 This was taken using a Canon 5D (Mk I), f=18mm, ISO 3200, 30 seconds at f/2.8. At ISO 1600 and f/4 - the limits we're assuming for consumer-grade equipment, remember - the exposure time would have had to be 2 minutes!! But that really is a sort of worst possible case. In those circumstances I'd have been quite happy to leave the camera to take a 2-minute exposure if that was the only chance I had to get something. I'd probably have taken a load of shots and overlaid them to get some star trailing, or something like that. In these dire sorts of conditions, I think your results are limited more by your imagination and your determination than by your equipment. In early 2014 I went to Tromsø in Norway and again the conditions weren't good. 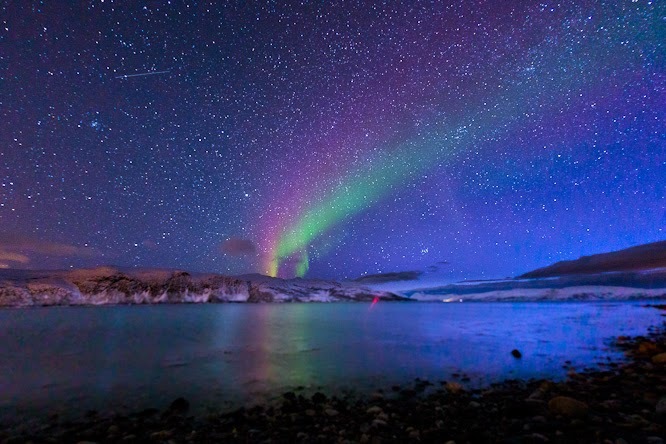 We had one night when things looked promising, but then it clouded over just as the aurora was starting to show; and we had one night when the skies eventually cleared, and we saw an aurora, but it wasn't great. This is from the first night: Canon 6D, f=15mm, ISO 3200, 2 seconds at f/2.8. At ISO 1600 and f/4 it would have been 8 seconds, which I think would have been workable. But you'll note that the overall illumination of the scene benefits from those clouds, which are reflecting light from some villages a couple of miles away. Without the clouds, I'd have had to use a longer exposure time or tolerate the landscape being dark and underexposed. And these are from the second night. Both shots are with the Canon 6D, f=15mm. The first was ISO 3200, 20 seconds at f/2.8; the selfie was at ISO 5000(!!! ), 15 seconds at f/2.8, and even then we had a bit of accidental help when somebody in the car park behind the camera switched on their car headlights At ISO 1600 and f/4 the exposure times would have had to be 80 seconds and about 90 seconds, which I don't think would have been workable. Certainly not for the selfie! Could you get away with a less wide lens? Yes, you could. For example I've illustrated below how these four photos could be cropped to stimulate what you'd get with a 24mm lens (15-16mm on DX). I think they're still quite acceptable from a compositional point of view. Acceptable, but I think definitely not ideal. Until I saw a half-decent aurora in Tromsø I really had no appreciation of how much of the sky they could occupy. Interestingly, a 24mm focal length also allows you to use an f/1.4 lens. (For example, the Canon EF 24mm f/1.4 L II USM or the Nikon AF-S 24mm f/1.4 G ED.) I've got to admit that I'm really not sure how valuable this would be, though. On the one hand, 24mm really isn't very wide at all unless you're using a full-frame (FX) DSLR, and they can usually cope at high enough ISOs that you perhaps don't really need f/1.4. On the other hand, f/1.4 is brilliantly fast and it might well come in handy - especially if you want to keep the ISO down in order to make a big print. (Remember how the ISO capability of your camera depends on what you want to do with the image?) I guess at the end of the day having a 24mm f/1.4 lens in your bag gives you options that you wouldn't have otherwise, and that can't be a bad thing. You'll have noticed that there was a sort of common theme to my aurora photos. In the three new-moon cloudless-sky faint-aurora photos, I've relied on the fact that I could shoot at ISO 3200 or above, and that I've had an f/2.8 lens. If I had been limited to ISO 1600 and f/4 - our notional consumer-grade equipment - the exposure times for these three photos would have been in the range of 80 to 120 seconds. That's not good. 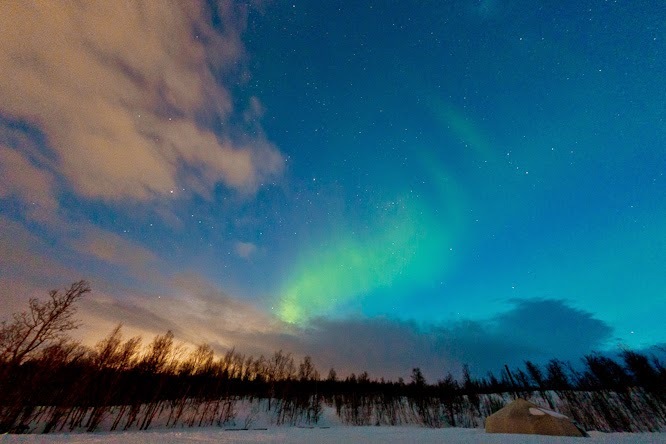 If you have moonlight and a bright aurora, you'll be fine with a consumer-grade DSLR and a wide-angle lens. But if you don't ... you might not be. 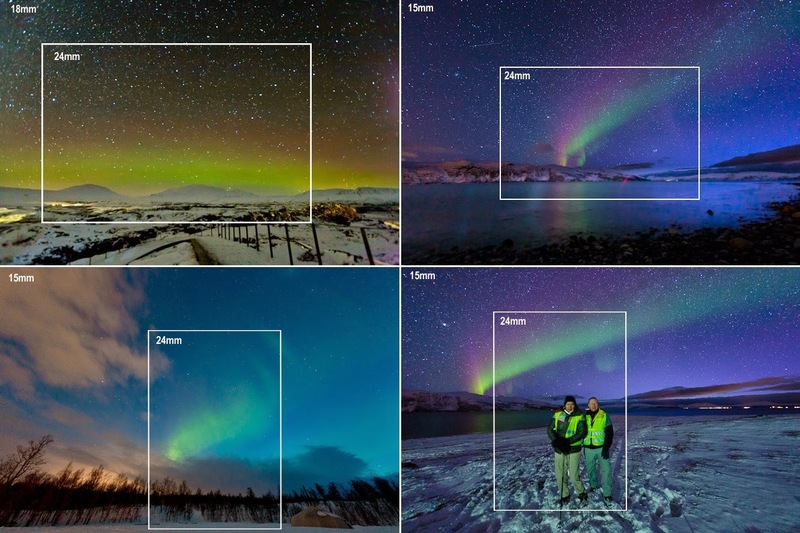 If you don't already own a full-frame camera and an ultra-wide full-frame lens, I'm not going to say that you should buy or hire one for your Northern Lights trip, for two reasons. Firstly, one very important consideration is that operating a camera in the dark really isn't easy, and you need to know your way around the controls. It could be that you'd be happier with a camera that you know well, rather than one which is theoretically superior but unfamiliar. Or perhaps not. It depends what sort of person you are, I guess, and how easily you pick these sorts of things up. And secondly, because you might not need it. If you get a good light show and good moonlight, you can get decent results with a lower-spec camera and lens. Or if it's cloudy every night, it doesn't matter what camera you've got! But it's clear, I think, that there are definitely some conditions in which consumer-grade kit would struggle, and something like a Canon 6D / Nikon D600 (or better!) and an f/2.8 lens would cope better. At the end of the day it's for you to decide how likely you think that is, how important it is to you, and whether it's worth the money.